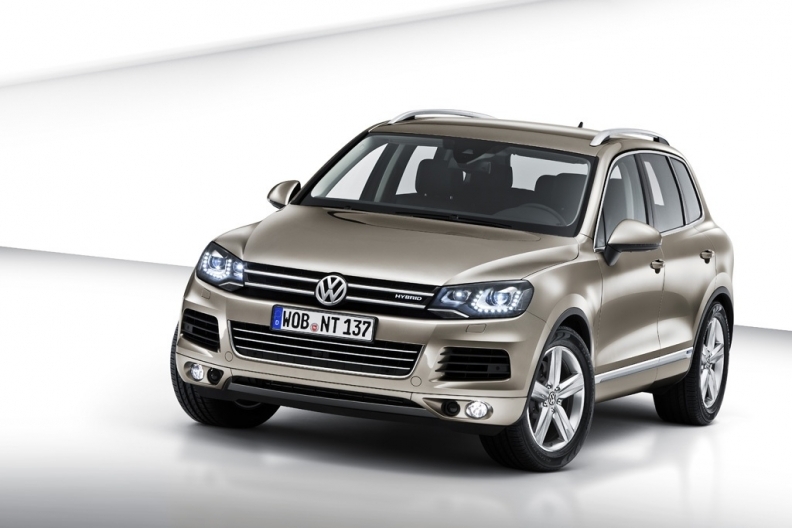 The VW Touareg will share its hybrid system with the Porsche Cayenne and Audi Q7. The second-generation Volkswagen Touareg premium SUV is 208kg (about 460 pounds) lighter and about 20 percent more fuel efficient than the current model. VW showed off the new Touareg at an event Wednesday night in Munich ahead of its public debut at the Geneva auto show in early March. The SUV’s reduced fuel usage comes thanks to a hybrid system mated with a V-6 gasoline engine. The hybrid Touareg can travel short distances at speeds up to 50kph (about 30 mph) in full-electric mode and uses 8.2 liters of fuel per 100km (28.68 U.S. mpg). The Touareg will share the hybrid technology with its platform mates, the Porsche Cayenne and Audi Q7. The new Touareg also will offer V-6 and V-8 diesel engines. All powerplants will be combined with a new eight-speed automatic transmission. VW says the new Touareg is the brand’s most technically innovative model ever. The car’s high-end features include: lane assist, which keeps the car from straying outside its lane; blind-spot warning, which warns when vehicles are approaching from the side when the driver wants to change lanes; and adaptive cruise control with the ability to regulate speed based on the car in front as well as the ability to brake to a complete stop in an emergency if the driver does not react quickly enough. The new Touareg will arrive at dealerships starting in April.